View cart “Tulle Bustle Skirt” has been added to your cart. 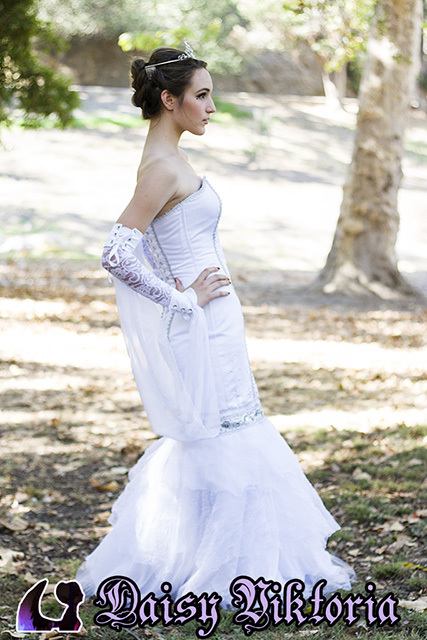 Become a fairytale bride in this beautiful white satin gown! Rhinestones accent the fitted bodice, in between elongating lines of carefully placed silver trim. An elegant beaded trim accents the skirt, which flows in tulle and chiffon. The chiffon features a burned hem for an organic ethereal effect. 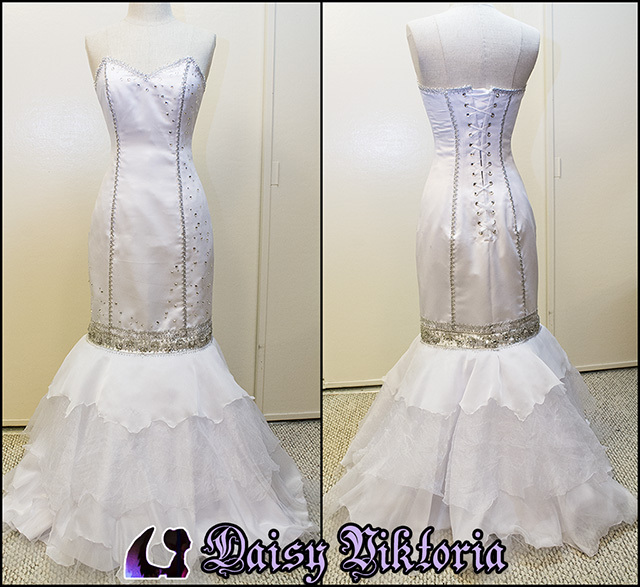 The gown is fully reinforced and lined for a corset effect. While not a tight-lacing corset, this gown will help to enhance your shape. 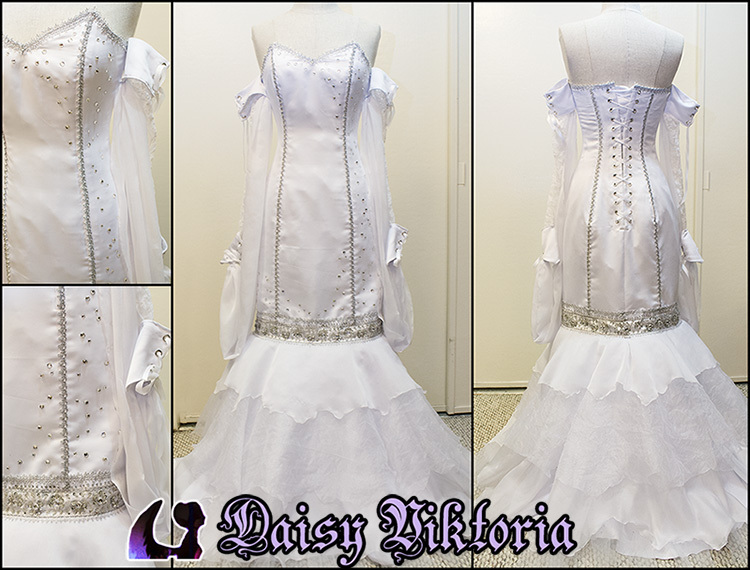 The gown laces in the back with satin ribbon. Request this gown with or without the arm pieces. The optional arm pieces are made of satin, chiffon, and stretch lace. Want a different color or variation? 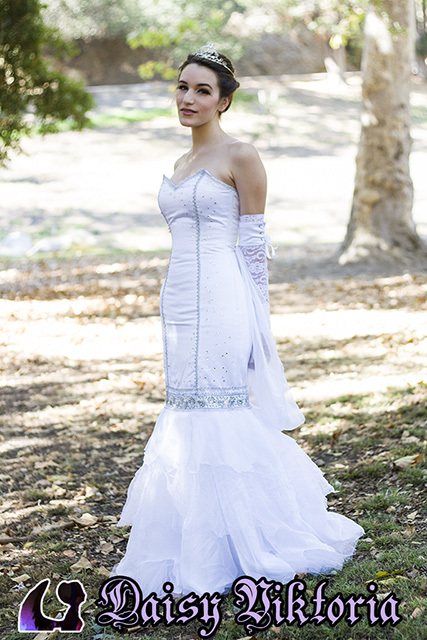 Message us to request a custom gown! This gown is made to order. Please allow 6-8 weeks for production. Tell us about your fantasy vision, and we will make your dreams come true! 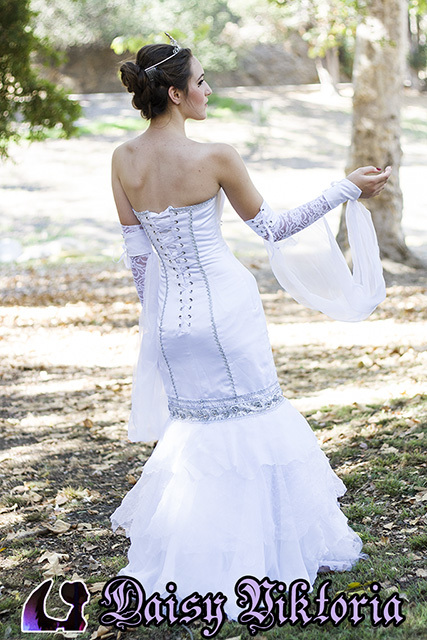 Our fantasy couture gowns and corsets are made of quality hand selected materials. 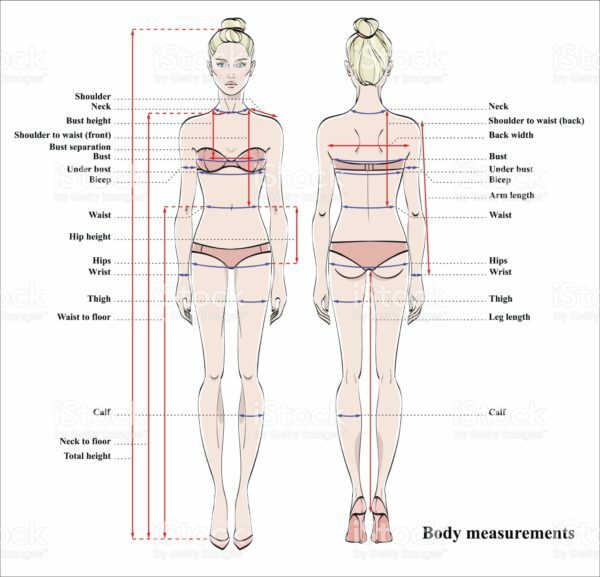 Our corsets are made of authentic steel boning and meant for durable shaping. Each item is lovingingly hand crafted by the designer with exceptional standards and materials and a little bit of faerie magick. 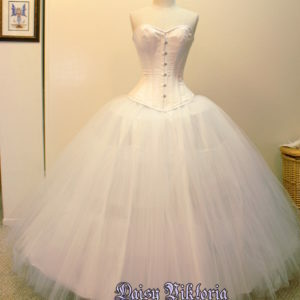 Designed and hand crafted by Daisy Viktoria herself, our fairytale gowns and specialty corsets are perfect for a unique and awe inspiring sense of fashion. To request your own custom specialty gown or corset, please use our Custom Order Form. Get our exclusive updates, new features, and special offers delivered right to your inbox! Follow us on Patreon for exclusive photo sets, behind the scenes fun, and tutorials!